Deng Xiaoping (/ˈdʌŋ ˌʃaʊˈpɪŋ/, also UK: /ˈdɛŋ, ˈsjaʊpɪŋ/; courtesy name Xixian; 22 August 1904 – 19 February 1997) was a Chinese politician who was the paramount leader of the People's Republic of China from 1978 until his retirement in 1989. After Chairman Mao Zedong's death in 1976, Deng led China through far-reaching market-economy reforms. Born into a peasant background in Guang'an, Sichuan province, Deng studied and worked in France in the 1920s, where he became a follower of Marxism–Leninism. He joined the Communist Party of China in 1923. Upon his return to China, he joined the party organization in Shanghai, then was a political commissar for the Red Army in rural regions and by the late 1930s was considered a "revolutionary veteran" because he participated in the Long March. Following the founding of the People's Republic in 1949, Deng worked in Tibet and the southwest region to consolidate Communist control. As the party's Secretary General in the 1950s, Deng presided over Anti-Rightist Campaigns and became instrumental in China's economic reconstruction following the Great Leap Forward of 1957–1960. However, his economic policies caused him to fall out of favor with Mao Zedong and was purged twice during the Cultural Revolution. Following Mao Zedong's death in 1976, Deng outmanoeuvred the late chairman's chosen successor Hua Guofeng in December 1978. Inheriting a country beset with social conflict, disenchantment with the Communist Party and institutional disorder resulting from the chaotic policies of the Mao era, Deng became the paramount figure of the "second generation" of party leadership. While Deng never held office as the head of state, head of government or General Secretary (leader of the Communist Party), some called him "the architect" of a new brand of thinking that combined socialist ideology with free enterprise whose slogan was "socialism with Chinese characteristics". Deng opened China to foreign investment and the global market, policies that are credited with developing China into one of the fastest-growing economies in the world for several generations and raising the standard of living of hundreds of millions. Deng was the Time Person of the Year in 1978 and 1985, the third Chinese leader (after Chiang Kai-shek and his wife Soong Mei-ling) and the fourth communist leader (after Joseph Stalin, picked twice; and Nikita Khrushchev) to be selected. He was criticized for ordering the crackdown on the Tiananmen Square protests of 1989, but praised for his reaffirmation of the reform program in his Southern Tour of 1992 and the reversion of Hong Kong to Chinese control in 1997. Deng died in February 1997, aged 92. Deng possibly has ancestry from ethnically Hakka Han family in the village of Paifang (zh), in the town of Xiexing [zh], Guang'an County in Sichuan province, approximately 160 km (99 mi) from Chongqing (formerly spelled Chungking). Deng's ancestors can be traced back to Jiaying county (now renamed to Meixian), Guangdong, a prominent ancestral area for the Hakka people, and had been settled in Sichuan for several generations. Deng Xiaoping's daughter Deng Rong wrote in the book My father Deng Xiaoping (我的父亲邓小平) that his ancestry was probably but not definitely Hakka. Sichuan was originally the origin of the Deng lineage until one of them was hired as an official in Guangdong during the Ming dynasty but during the Qing plan to increase the population in 1671 they came to Sichuan again. Deng Xiaoping was born in Sichuan. 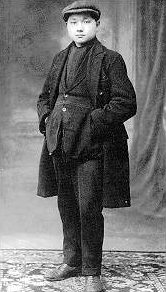 Deng's father, Deng Wenming, was a middle-level landowner and had studied at the University of Law and Political Science in Chengdu. His mother, surnamed Dan, died early in Deng's life, leaving Deng, his three brothers and three sisters. At the age of five Deng was sent to a traditional Chinese-style private primary school, followed by a more modern primary school at the age of seven. Deng's first wife, one of his schoolmates from Moscow, died aged 24 a few days after giving birth to Deng's first child, a baby girl who also died. His second wife, Jin Weiying, left him after Deng came under political attack in 1933. His third wife Zhuo Lin was the daughter of an industrialist in Yunnan Province. She became a member of the Communist Party in 1938, and married Deng a year later in front of Mao's cave dwelling in Yan'an. They had five children: three daughters (Deng Lin, Deng Nan and Deng Rong) and two sons (Deng Pufang and Deng Zhifang). 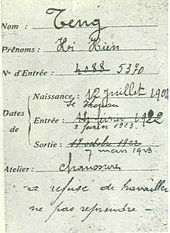 Deng's name is spelled Teng Hi Hien on this employment card from the Hutchinson shoe factory in Châlette-sur-Loing, France, where he worked on two occasions as seen from the dates, eight months in 1922 and again in 1923 when he was fired after one month, with the bottom annotation reading "refused to work, do not take him back"
When Deng first attended school, his tutor objected to his having the given name "Xiānshèng" (先聖), calling him "Xīxián" (希賢), which includes the characters "to aspire to" and "goodness", with overtones of wisdom. In the summer of 1919, Deng Xiaoping graduated from the Chongqing School. He and 80 schoolmates travelled by ship to France (travelling steerage) to participate in the Diligent Work-Frugal Study Movement, a work-study program in which 4,001 Chinese would participate by 1927. Deng, the youngest of all the Chinese students in the group, had just turned 15. Wu Yuzhang, the local leader of the Movement in Chongqing, enrolled Deng and his paternal uncle, Deng Shaosheng, in the program. Deng's father strongly supported his son's participation in the work-study abroad program. The night before his departure, Deng's father took his son aside and asked him what he hoped to learn in France. He repeated the words he had learned from his teachers: "To learn knowledge and truth from the West in order to save China." Deng was aware that China was suffering greatly, and that the Chinese people must have a modern education to save their country. In December 1920 a French packet ship, the André Lyon, sailed into Marseille with 210 Chinese students aboard including Deng. The sixteen-year-old Deng briefly attended middle schools in Bayeux and Châtillon, but he spent most of his time in France working. His first job was as a fitter at the Le Creusot Iron and Steel Plant in La Garenne-Colombes, a south-western suburb of Paris where he moved in April 1921. Coincidentally, when Deng Xiaoping's later political fortunes were down and he was sent to work in a tractor factory in 1974 he found himself a fitter again and proved to still be a master of the skill. In La Garenne-Colombes Deng met Zhou Enlai, Nie Rongzhen, Cai Hesen, Zhao Shiyan and Li Wenhai. Under the influence of these older Chinese students in France, Deng began to study Marxism and engaged in political dissemination work. In 1921 he joined the Chinese Communist Youth League in Europe. In the second half of 1924, he joined the Chinese Communist Party and became one of the leading members of the General Branch of the Youth League in Europe. In 1926 Deng traveled to the Soviet Union and studied at Moscow Sun Yat-sen University, where one of his classmates was Chiang Ching-kuo, the son of Chiang Kai-shek. In late 1927, Deng left Moscow to return to China, where he joined the army of Feng Yuxiang, a military leader in northwest China, who had requested assistance from the Soviet Union in his struggle with other local leaders in the region. At that time, the Soviet Union, through the Comintern, an international organization supporting the communist movements, supported the Communists' alliance with the Nationalists of the Kuomintang (KMT) party founded by Sun Yat-sen. He arrived in Xi'an, the stronghold of Feng Yuxiang, in March 1927. He was part of the Fengtian clique's attempt to prevent the break of the alliance between the KMT and the Communists. This split resulted in part from Chiang Kai-shek's forcing them to flee areas controlled by the KMT. After the breakup of the alliance between communists and nationalists, Feng Yuxiang stood on the side of Chiang Kai-shek, and the Communists who participated in their army, such as Deng Xiaoping, were forced to flee. In 1929 Deng led the Baise Uprising in Guangxi province against the Kuomintang (KMT) government. The uprising failed and Deng went to the Central Soviet Area in Jiangxi province. Although Deng got involved in the Marxist revolutionary movement in China, the historian Mobo Gao has argued that "Deng Xiaoping and many like him [in the Chinese Communist Party] were not really Marxists, but basically revolutionary nationalists who wanted to see China standing on equal terms with the great global powers. They were primarily nationalists and they participated in the Communist revolution because that was the only viable route they could find Chinese nationalism." After leaving the army of Feng Yuxiang in the northwest, Deng ended up in the city of Wuhan, where the Communists at that time had their headquarters. At that time, he began using the nickname "Xiaoping" and occupied prominent positions in the party apparatus. He participated in the historic emergency session on 7 August 1927 in which, by Soviet instruction, the Party dismissed its founder Chen Duxiu, and Qu Qiubai became the secretary general. In Wuhan, Deng first established contact with Mao Zedong, who was then little valued by militant pro-Soviet leaders of the party. Between 1927 and 1929, Deng lived in Shanghai, where he helped organize protests that would be harshly persecuted by the Kuomintang authorities. The death of many Communist militants in those years led to a decrease in the number of members of the Communist Party, which enabled Deng to quickly move up the ranks. During this stage in Shanghai, Deng married a woman he met in Moscow, Zhang Xiyuan. Beginning in 1929, he participated in the struggle against the Kuomintang in Guangxi. The superiority of the forces of Chiang Kai-shek caused a huge number of casualties in the Communist ranks. The confrontational strategy of the party leadership was a failure that killed many militants. The response to this defeat catalyzed one of the most confusing episodes in the biography of Deng: in March 1931, he left the Communist Army seventh battalion to appear sometime later in Shanghai. His official biography states that Deng had been charged by his superiors with deserting from the battle zone before fleeing to Shanghai, where there were leaders of the underground Communist Party. Although he was not punished in Shanghai, this episode in his biography remains unclear and would be used against him to question his devotion to the Communist Party during the Cultural Revolution era. After returning to Shanghai, Deng discovered that his wife and daughter had died during childbirth. In addition, he discovered that many of his former comrades had died as a result of the Kuomintang's crackdown against the Communists. The campaigns against the Communists in the cities represented a setback for the party and in particular to the Comintern Soviet advisers, who saw the mobilization of the urban proletariat as the force for the advancement of communism. Contrary to the urban vision of the revolution, based on the Soviet experience, the Communist leader Mao Zedong saw the rural peasants as the revolutionary force in China. In a mountainous area of Jiangxi province, where Mao went to establish a communist system, there developed the embryo of a future state of China under communism, which adopted the official name of the Chinese Soviet Republic, but was better known as the "Jiangxi Soviet". In one of the most important cities in the Soviet zone, Ruijin, Deng took over as secretary of the Party Committee in the summer of 1931. In the winter of 1932, Deng went on to play the same position in the nearby district of Huichang. In 1933 he became director of the propaganda department of the Provincial Party Committee in Jiangxi. It was then that he married a young woman he had met in Shanghai named Jin Weiying. The successes of the Soviet in Jiangxi made the party leaders decide to move to Jiangxi from Shanghai. The confrontation among Mao, the party leaders, and their Soviet advisers was increasingly tense and the struggle for power between the two factions led to the removal of Deng, who favored the ideas of Mao, from his position in the propaganda department. Despite the strife within the party, the Jiangxi Soviet became the first successful experiment of communist rule in rural China. It even issued stamps and paper money under the letterhead of the Soviet Republic of China, and the army of Chiang Kai-shek finally decided to attack the communist area. Surrounded by the more powerful army of the Republic of China, the Communists fled Jiangxi in October 1934. Thus began the epic movement that would mark a turning point in the development of Chinese communism. The evacuation was difficult because the Army of the Republic had taken positions in all areas occupied by the Communists. Advancing through remote and mountainous terrain, some 100,000 men managed to escape Jiangxi, starting a long strategic retreat through the interior of China, which ended one year later when between 8,000 and 9,000 survivors reached the northern province of Shaanxi. During the Zunyi Conference at the beginning of the Long March, the so-called 28 Bolsheviks, led by Bo Gu and Wang Ming, were ousted from power and Mao Zedong, to the dismay of the Soviet Union, had become the new leader of the Communist Party of China. The pro-Soviet Communist Party of China had ended and a new rural-inspired party emerged under the leadership of Mao. Deng had once again become a leading figure in the party when the north ended up winning the civil war against the Kuomintang. The confrontation between the two parties was temporarily interrupted, however, by the Japanese invasion, forcing the Kuomintang to form an alliance for the second time with the Communists to defend the nation against external aggression. The invasion of Japanese troops in 1937 marked the beginning of the Second Sino-Japanese War. During the invasion, Deng remained in the area controlled by the Communists in the north, where he assumed the role of deputy political director of the three divisions of the restructured Communist army. From September 1937 until January 1938, he lived in Buddhist monasteries and temples in the Wutai Mountains. In January 1938, he was appointed as Political Commissar of the 129th division of the Eighth Route Army commanded by Liu Bocheng, starting a long-lasting partnership with Liu. Deng stayed for most of the conflict with the Japanese in the war front in the area bordering the provinces of Shanxi, Henan and Hebei, then traveled several times to the city of Yan'an, where Mao had established the basis for Communist Party leadership. In one of his trips to Yan'an in 1939, he married, for the third and last time in his life, Zhuo Lin, a young native of Kunming, who, like other young idealists of the time, had traveled to Yan'an to join the Communists. Deng took a leading role in the Hundred Regiments Offensive which boosted his standing among his comrades. After Japan's defeat in World War II, Deng traveled to Chongqing, the city in which Chiang Kai-shek established his government during the Japanese invasion, to participate in peace talks between the Kuomintang and the Communist Party. The results of those negotiations were not positive and military confrontation between the two antagonistic parties resumed shortly after the meeting in Chongqing. While Chiang Kai-shek re-established the government in Nanjing, the capital of the Republic of China, the Communists were fighting for control in the field. Following up with guerrilla tactics from their positions in rural areas against cities under the control of the government of Chiang and their supply lines, the Communists were increasing the territory under their control, and incorporating more and more soldiers who had deserted the Nationalist army. Deng played a major part in the Huaihai Campaign against the nationalists. In the final phase of the war, Deng again exercised a key role as political leader and propaganda master as Political Commissar of the 2nd Field Army commanded by Liu Bocheng. He also participated in disseminating the ideas of Mao Zedong, which turned into the ideological foundation of the Communist Party. His political and ideological work, along with his status as a veteran of the Long March, placed him in a privileged position within the party to occupy positions of power after the Communist Party managed to defeat Chiang Kai-shek and founded the People's Republic of China. On 1 October 1949, Deng attended the proclamation of the People's Republic of China in Beijing. At that time, the Communist Party controlled the entire north, but there were still parts of the south held by the Kuomintang regime. He became responsible for leading the annexation of southwest China, in his capacity as the first secretary of the Department of the Southwest. This organization had the task of managing the final takeover of that part of the country still held by the Kuomintang; Tibet remained independent for another year. The Kuomintang government was being forced to leave Guangzhou, and established Chongqing as a new provisional capital. 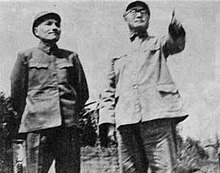 There, Chiang Kai-shek and his son Chiang Ching-kuo, a former classmate of Deng in Moscow, wanted to stop the advance of the Communist Party forces. Under the political control of Deng, the Communist army took over Chongqing in late November 1949 and entered Chengdu, the last bastion of power of Chiang Kai-shek, a few days later. At that time Deng became mayor of Chongqing, while he simultaneously was the leader of the Communist Party in the southwest, where the Communist army, now proclaiming itself the People's Liberation Army, suppressed resistance loyal to the old Kuomintang regime. In 1950, the Communist Party-ruled state also seized control over Tibet. Deng Xiaoping would spend three years in Chongqing, the city where he had studied in his teenage years before going to France. In 1952 he moved to Beijing, where he occupied different positions in the central government. In July 1952, Deng came to Beijing to assume the posts of Vice Premier and Deputy Chair of the Committee on Finance. Soon after, he took the posts of Minister of Finance and Director of the Office of Communications. In 1954, he was removed from all these positions, holding only the post of Deputy Premier. In 1956, he became Head of the Communist Party's Organization Department and member of the Central Military Commission. After officially supporting Mao Zedong in his Anti-Rightist Movement of 1957, Deng acted as Secretary General of the Secretariat and ran the country's daily affairs with President Liu Shaoqi and Premier Zhou Enlai. Deng and Liu's policies emphasized economics over ideological dogma, an implicit departure from the mass hysteria of the Great Leap Forward. 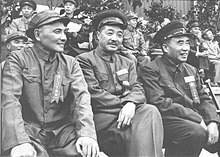 Both Liu and Deng supported Mao in the mass campaigns of the 1950s, in which they attacked the bourgeois and capitalists, and promoted Mao's ideology. However, the economic failure of the Great Leap Forward was seen as an indictment on the ability of Mao to manage the economy. Peng Dehuai openly criticized Mao, while Liu Shaoqi and Deng, though more cautious, began to take charge of economic policy, leaving Mao out of day-to-day affairs of the party and state. Mao agreed to cede the presidency of the People's Republic of China (China's de jure head of state position) to Liu Shaoqi, while retaining his positions as leader of the party and the army. At the 8th National Congress of the Communist Party of China in 1956, Deng supported removing all references to "Mao Zedong Thought" from the party statutes. In 1963, Deng traveled to Moscow to lead a meeting of the Chinese delegation with Stalin's successor, Nikita Khrushchev. Relations between the People's Republic of China and the Soviet Union had worsened since the death of Stalin. After this meeting, no agreement was reached and the Sino–Soviet split was consummated; there was an almost total suspension of relations between the two major communist powers of the time. Liu and Deng's economic reforms of the early 1960s were generally popular and restored many of the economic institutions previously dismantled during the Great Leap Forward. Mao, sensing his loss of prestige, took action to regain control of the state. Appealing to his revolutionary spirit, Mao launched the Cultural Revolution, which encouraged the masses to root out the right-wing capitalists who have "infiltrated the party". Deng was labelled the second-in-command of the capitalist roader faction. Mao feared that the reformist economic policies of Deng and Liu could lead to restoration of capitalism and end the Chinese Revolution. For this and other reasons, Mao launched the Cultural Revolution in 1966, during which Deng fell out of favor and was forced to retire from all his positions. 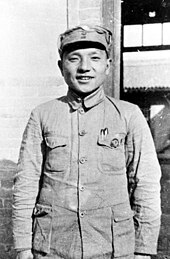 During the Cultural Revolution, he and his family were targeted by Red Guards, who imprisoned Deng's eldest son, Deng Pufang. Deng Pufang was tortured and jumped out, or was thrown out, of the window of a four-story building in 1968, becoming a paraplegic. In October 1969 Deng Xiaoping was sent to the Xinjian County Tractor Factory in rural Jiangxi province to work as a regular worker. In his four years there, Deng spent his spare time writing. He was purged nationally, but to a lesser scale than President Liu Shaoqi. After Lin Biao was killed in an air crash (according to official reports he was trying to flee from China after unsuccessfully trying to stage a coup against Mao), Deng Xiaoping (who had been political commissar of the 2nd Field Army during the civil war) became the most influential of the remaining army leaders. 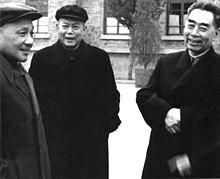 When Premier Zhou Enlai fell ill with cancer, Deng became Zhou's choice as successor, and Zhou was able to convince Mao to bring Deng back into politics in 1974 as First Vice-Premier, in practice running daily affairs. Deng focused on reconstructing the country's economy and stressed unity as the first step by raising production. He remained careful, however, to avoid contradicting Maoist ideology on paper. During his brief ascendency, Deng established the Political Research Office, headed by intellectuals Hu Qiaomu, Yu Guangyuan and Hu Sheng, delegated to explore approaches to political and economic reforms. He led the group himself and managed the project within the State Council, in order to avoid rousing the suspicions of the Gang of Four. The Cultural Revolution was not yet over, and a radical leftist political group known as the Gang of Four, led by Mao's wife Jiang Qing, competed for power within the Party. The Gang saw Deng as their greatest challenge to power. Mao, too, was suspicious that Deng would destroy the positive reputation of the Cultural Revolution, which Mao considered one of his greatest policy initiatives. Beginning in late 1975, Deng was asked to draw up a series of self-criticisms. Although he admitted to having taken an "inappropriate ideological perspective" while dealing with state and party affairs, he was reluctant to admit that his policies were wrong in essence. His antagonism with the Gang of Four became increasingly clear, and Mao seemed to sway in the Gang's favour. Mao refused to accept Deng's self-criticisms and asked the party's Central Committee to "discuss Deng's mistakes thoroughly". Zhou Enlai died in January 1976, to an outpouring of national grief. Zhou was a very important figure in Deng's political life, and his death eroded his remaining support within the Party's Central Committee. After Deng delivered Zhou's official eulogy at the state funeral, the Gang of Four, with Mao's permission, began the so-called Criticize Deng and Oppose the Rehabilitation of Right-leaning Elements campaign. Hua Guofeng, not Deng, was selected to become Zhou's successor. On 2 February 1976, the Central Committee issued a Top-Priority Directive, officially transferring Deng to work on "external affairs" and thus removing Deng from the party's power apparatus. Deng stayed at home for several months, awaiting his fate. The Political Research Office was promptly dissolved, and Deng's advisers such as Yu Guangyuan suspended. As a result, the political turmoil halted the economic progress Deng had laboured for in the past year. On 3 March, Mao issued a directive reaffirming the legitimacy of the Cultural Revolution and specifically pointed to Deng as an internal, rather than external, problem. This was followed by a Central Committee directive issued to all local party organs to study Mao's directive and criticize Deng. Deng's reputation as a reformer suffered a severe blow when the Qingming Festival, after the mass public mourning of Zhou on a traditional Chinese holiday, culminated in the Tiananmen Incident of 1976, an event the Gang of Four branded as counter-revolutionary and threatening to their power. Furthermore, the Gang deemed Deng the mastermind behind the incident, and Mao himself wrote that "the nature of things has changed". This prompted Mao to remove Deng from all leadership positions, although he retained his party membership. Following Mao's death on 9 September 1976 and the purge of the Gang of Four in October 1976, Deng gradually emerged as the de facto leader of China. Prior to Mao's death, the only governmental position he held was that of First Vice Premier of the State Council, but Hua Guofeng wanted to rid the Party of extremists and successfully marginalised the Gang of Four. On 22 July 1977, Deng was restored to the posts of Vice-Chairman of the Central Committee, Vice-Chairman of the Military Commission and Chief of the General Staff of the People's Liberation Army. By carefully mobilizing his supporters within the party, Deng outmaneuvered Hua, who had pardoned him, then ousted Hua from his top leadership positions by 1980. In contrast to previous leadership changes, Deng allowed Hua to retain membership in the Central Committee and quietly retire, helping to set the precedent that losing a high-level leadership struggle would not result in physical harm. Deng repudiated the Cultural Revolution and, in 1977, launched the "Beijing Spring", which allowed open criticism of the excesses and suffering that had occurred during the period. Meanwhile, he was the impetus for the abolition of the class background system. Under this system, the CPC removed employment barriers to Chinese deemed to be associated with the former landlord class; its removal allowed a faction favoring the restoration of the private market to enter the Communist Party. Deng gradually outmaneuvered his political opponents. By encouraging public criticism of the Cultural Revolution, he weakened the position of those who owed their political positions to that event, while strengthening the position of those like himself who had been purged during that time. Deng also received a great deal of popular support. As Deng gradually consolidated control over the CPC, Hua was replaced by Zhao Ziyang as premier in 1980, and by Hu Yaobang as party chief in 1981, despite the fact that Hua was Mao Zedong's designated successor as the "paramount leader" of the Communist Party of China and the People's Republic of China. Important decisions were always taken in Deng's home in Zhongnanhai with a caucus of eight senior party cadres, called "Eight Elders", especially with Chen Yun and Li Xiannian. Deng ruled as "paramount leader" although he never held the top title of the party, and was able to successively remove three party leaders, including Hu Yaobang. Deng remained the most influential of the CPC cadre, although after 1987 his only official posts were as chairman of the state and Communist Party Central Military Commissions. Deng's elevation to China's new number-one figure meant that the historical and ideological questions around Mao Zedong had to be addressed properly. Because Deng wished to pursue deep reforms, it was not possible for him to continue Mao's hard-line "class struggle" policies and mass public campaigns. In 1982 the Central Committee of the Communist Party released a document entitled On the Various Historical Issues since the Founding of the People's Republic of China. Mao retained his status as a "great Marxist, proletarian revolutionary, militarist, and general", and the undisputed founder and pioneer of the country and the People's Liberation Army. "His accomplishments must be considered before his mistakes", the document declared. Deng personally commented that Mao was "seven parts good, three parts bad." The document also steered the prime responsibility of the Cultural Revolution away from Mao (although it did state that "Mao mistakenly began the Cultural Revolution") to the "counter-revolutionary cliques" of the Gang of Four and Lin Biao. During his paramount leadership, his official state positions were Chairman of the National Committee of the Chinese People's Political Consultative Conference from 1978–1983 and Chairman of the Central Military Commission of the People's Republic of China from 1983–1990, while his official party positions were Vice Chairman of the Communist Party of China from 1977–1982 and Chairman of the Central Military Commission of the Communist Party of China from 1981–1989. In November 1978, after the country had stabilized following political turmoil, Deng visited Bangkok, Kuala Lumpur and Singapore and met with Singapore's Prime Minister Lee Kuan Yew. Deng was very impressed with Singapore's economic development, greenery and housing, and later sent tens of thousands of Chinese to Singapore and countries around the world to learn from their experiences and bring back their knowledge. Lee, on the other hand, advised Deng to stop exporting Communist ideologies to Southeast Asia, advice that Deng later followed. Thanks to the support of other party leaders who had already recovered their official positions, in 1978 the rise to power of Deng was inevitable. Even though Hua Guofeng formally monopolized the top positions in the People's Republic, his position, with little support, was becoming increasingly difficult. In December 1978, during the Third Plenum of the 11th Central Committee Congress of the Communist Party of China, Deng took over the reins of power. Beginning in 1979, the economic reforms accelerated the market model, while the leaders maintained old Communist-style rhetoric. The commune system was gradually dismantled and the peasants began to have more freedom to manage the land they cultivated and sell their products on the market. At the same time, China's economy opened up to foreign trade. On January 1, 1979, the United States recognized the People's Republic of China, leaving the (Taiwan) Republic of China's nationalist government to one side, and business contacts between China and the West began to grow. In late 1978, the aerospace company Boeing announced the sale of 747 aircraft to various airlines in the PRC, and the beverage company Coca-Cola made public their intention to open a production plant in Shanghai. In early 1979, Deng undertook an official visit to the United States, meeting President Jimmy Carter in Washington as well as several Congressmen. The Chinese insisted that former President Richard Nixon be invited to the formal White House reception, a symbolic indication of their assertiveness on the one hand, and their desire to continue with the Nixon initiatives on the other. During the visit, Deng visited the Johnson Space Center in Houston, as well as the headquarters of Coca-Cola and Boeing in Atlanta and Seattle, respectively. With these visits so significant, Deng made it clear that the new Chinese regime's priorities were economic and technological development. Sino-Japanese relations also improved significantly. Deng used Japan as an example of a rapidly progressing power that set a good example for China economically. True to his famous July 1962 pronouncement at the Communist youth league conference, "it doesn't matter whether a cat is black or white, if it catches mice it is a good cat", which had caused so much criticism, Deng, along with his closest collaborators, such as Zhao Ziyang, who in 1980 relieved Hua Guofeng as premier, and Hu Yaobang, who in 1981 did the same with the post of party chairman, took the reins of power and the purpose of advancing the "four modernizations" (economy, agriculture, scientific and technological development and national defense), and announced an ambitious plan of opening and liberalizing the economy. The last position of power retained by Hua Guofeng, chairman of the Central Military Commission, was taken by Deng in 1981. From 1980 onwards, Deng led the expansion of the economy, and in political terms took over negotiations with the United Kingdom to return the territory of Hong Kong, meeting personally with then-Prime Minister Margaret Thatcher. 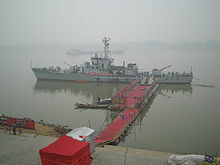 The result of these negotiations was the Sino-British Joint Declaration, signed on 19 December 1984, which formally outlined the United Kingdom's return of Hong Kong to China by 1997. The Chinese government pledged to respect the economic system and civil liberties of the British colony for fifty years after the handover. Under pressure from Chinese authorities, Portugal agreed in 1987 to arrange the return of Macau by 1999, with an agreement roughly equal to that of Hong Kong. The return of these two territories was based on a political principle formulated by Deng himself called "one country, two systems", which refers to the co-existence under one political authority of areas with different economic systems of communism and capitalism. Although this theory was applied to Hong Kong and Macau, Deng apparently intended to also present it as an attractive option to the people of Taiwan for eventual incorporation of that island, where sovereignty over the territory is still disputed. China's rapid economic growth presented several problems. The 1982 census revealed the extraordinary growth of the population, which already exceeded a billion people. Deng continued the plans initiated by Hua Guofeng to restrict birth to only one child, limiting women to one child under pain of administrative penalty. Around this time, Deng launched his first "strike hard" anti-crime campaign in August 1983. It was reported that the government set quotas for 5,000 executions by mid-November, and sources in Taiwan claimed that as many as 60,000 people were executed in that time, although more recent estimates have placed the number at 24,000 executed by firing squad within the first year of the campaign. Yet increasing economic freedom was being translated into a greater freedom of opinion, and critics began to arise within the system, including the famous dissident Wei Jingsheng, who coined the term "fifth modernization" in reference to democracy as a missing element in the renewal plans of Deng Xiaoping. In the late 1980s, dissatisfaction with the authoritarian regime and growing inequalities caused the biggest crisis to Deng's leadership. In October 1987, at the Plenary Session of the National People's Congress, Deng was re-elected as Chairman of the Central Military Commission, but he resigned as Chairman of the Central Advisory Commission and was succeeded by Chen Yun. Deng continued to chair and develop the reform and opening up as the main policy, and he advanced the three steps suitable for China's economic development strategy within seventy years: the first step, to double the 1980 GNP and ensure that the people have enough food and clothing, was attained by the end of the 1980s; the second step, to quadruple the 1980 GNP by the end of the 20th century, was achieved in 1995 ahead of schedule; the third step, to increase per capita GNP to the level of the medium-developed countries by 2050, at which point, the Chinese people will be fairly well-off and modernization will be basically realized. Deng did little to improve relations with the Soviet Union. He continued to adhere to the Maoist line of the Sino–Soviet split era that the Soviet Union was a superpower as "hegemonic" as the United States, but even more threatening to China because of its close proximity. Improving relations with the outside world was the second of two important philosophical shifts outlined in Deng's program of reform termed Gaige Kaifang (lit. Reforms and Openness). China's domestic social, political, and most notably, economic systems would undergo significant changes during Deng's time. The goals of Deng's reforms were summed up by the Four Modernizations, those of agriculture, industry, science and technology, and the military. "Planning and market forces are not the essential difference between socialism and capitalism. A planned economy is not the definition of socialism, because there is planning under capitalism; the market economy happens under socialism, too. Planning and market forces are both ways of controlling economic activity." Unlike Hua Guofeng, Deng believed that no policy should be rejected outright simply because it was not associated with Mao. 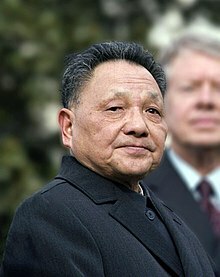 Unlike more conservative leaders such as Chen Yun, Deng did not object to policies on the grounds that they were similar to ones that were found in capitalist nations. Although Deng provided the theoretical background and the political support to allow economic reform to occur, the general consensus amongst historians is that few of the economic reforms that Deng introduced were originated by Deng himself. Premier Zhou Enlai, for example, pioneered the Four Modernizations years before Deng. In addition, many reforms would be introduced by local leaders, often not sanctioned by central government directives. If successful and promising, these reforms would be adopted by larger and larger areas and ultimately introduced nationally. An often cited example is the household responsibility system, which was first secretly implemented by a poor rural village at the risk of being convicted as "counter-revolutionary." This experiment proved very successful. Deng openly supported it and it was later adopted nationally. Many other reforms were influenced by the experiences of the East Asian Tigers. Deng's reforms actually included the introduction of planned, centralized management of the macro-economy by technically proficient bureaucrats, abandoning Mao's mass campaign style of economic construction. However, unlike the Soviet model, management was indirect through market mechanisms. Deng sustained Mao's legacy to the extent that he stressed the primacy of agricultural output and encouraged a significant decentralization of decision making in the rural economy teams and individual peasant households. At the local level, material incentives, rather than political appeals, were to be used to motivate the labor force, including allowing peasants to earn extra income by selling the produce of their private plots at free market. In the move toward market allocation, local municipalities and provinces were allowed to invest in industries that they considered most profitable, which encouraged investment in light manufacturing. Thus, Deng's reforms shifted China's development strategy to an emphasis on light industry and export-led growth. Light industrial output was vital for a developing country coming from a low capital base. With the short gestation period, low capital requirements, and high foreign-exchange export earnings, revenues generated by light manufacturing were able to be reinvested in technologically more advanced production and further capital expenditures and investments. However, in sharp contrast to the similar, but much less successful reforms in the Socialist Federal Republic of Yugoslavia and the People's Republic of Hungary, these investments were not government mandated. The capital invested in heavy industry largely came from the banking system, and most of that capital came from consumer deposits. One of the first items of the Deng reforms was to prevent reallocation of profits except through taxation or through the banking system; hence, the reallocation in state-owned industries was somewhat indirect, thus making them more or less independent from government interference. In short, Deng's reforms sparked an industrial revolution in China. These reforms were a reversal of the Maoist policy of economic self-reliance. China decided to accelerate the modernization process by stepping up the volume of foreign trade, especially the purchase of machinery from Japan and the West. By participating in such export-led growth, China was able to step up the Four Modernizations by attaining certain foreign funds, market, advanced technologies and management experiences, thus accelerating its economic development. From 1980, Deng attracted foreign companies to a series of Special Economic Zones, where foreign investment and market liberalization were encouraged. The reforms sought to improve labor productivity. New material incentives and bonus systems were introduced. Rural markets selling peasants' homegrown products and the surplus products of communes were revived. Not only did rural markets increase agricultural output, they stimulated industrial development as well. With peasants able to sell surplus agricultural yields on the open market, domestic consumption stimulated industrialization as well and also created political support for more difficult economic reforms. There are some parallels between Deng's market socialism especially in the early stages, and Vladimir Lenin's NEP as well as those of Nikolai Bukharin's economic policies, in that both foresaw a role for private entrepreneurs and markets based on trade and pricing rather than central planning. An interesting anecdote on this note is the first meeting between Deng and Armand Hammer. Deng pressed the industrialist and former investor in Lenin's Soviet Union for as much information on the NEP as possible. The Tiananmen Square protests of 1989, culminating in the June Fourth Massacre, were a series of demonstrations in and near Tiananmen Square in the People's Republic of China (PRC) between 15 April and 5 June 1989, a year in which many other socialist governments collapsed. The protests were sparked by the death of Hu Yaobang, a reformist official backed by Deng but ousted by the Eight Elders and the conservative wing of the politburo. 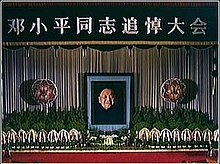 Many people were dissatisfied with the party's slow response and relatively subdued funeral arrangements. Public mourning began on the streets of Beijing and universities in the surrounding areas. In Beijing this was centered on the Monument to the People's Heroes in Tiananmen Square. The mourning became a public conduit for anger against perceived nepotism in the government, the unfair dismissal and early death of Hu, and the behind-the-scenes role of the "old men". By the eve of Hu's funeral, the demonstration had reached 100,000 people on Tiananmen Square. While the protests lacked a unified cause or leadership, participants raised the issue of corruption within the government and some voiced calls for economic liberalization and democratic reform within the structure of the government while others called for a less authoritarian and less centralized form of socialism. During the demonstrations, Deng's pro-market ally general secretary Zhao Ziyang supported the demonstrators and distanced himself from the Politburo. Martial law was declared on 20 May by the socialist hardliner Li Peng, but the initial military advance on the city was blocked by residents. The movement lasted seven weeks. On 3–4 June, over two hundred thousand soldiers in tanks and helicopters were sent into the city to quell the protests by force, resulting in hundreds of casualties. Many ordinary people in Beijing believed that Deng had ordered the intervention, but political analysts do not know who was actually behind the order. However, Deng's daughter defends the actions that occurred as a collective decision by the party leadership. To purge sympathizers of Tiananmen demonstrators, the Communist Party initiated a one-and-a-half-year-long program similar to the Anti-Rightist Movement. Old-timers like Deng Fei aimed to deal "strictly with those inside the party with serious tendencies toward bourgeois liberalization", and more than 30,000 communist officers were deployed to the task. Zhao was placed under house arrest by hardliners and Deng himself was forced to make concessions to them. He soon declared that "the entire imperialist Western world plans to make all socialist countries discard the socialist road and then bring them under the monopoly of international capital and onto the capitalist road". A few months later he said that the "United States was too deeply involved" in the student movement, referring to foreign reporters who had given financial aid to the student leaders and later helped them escape to various Western countries, primarily the United States through Hong Kong and Taiwan. Although Deng initially made concessions to the socialist hardliners, he soon resumed his reforms after his 1992 southern tour. After his tour, he was able to stop the attacks of the socialist hardliners on the reforms through their "named capitalist or socialist?" campaign. Officially, Deng decided to retire from top positions when he stepped down as Chairman of the Central Military Commission in 1989, and retired from the political scene in 1992. China, however, was still in the era of Deng Xiaoping. He continued to be widely regarded as the "paramount leader" of the country, believed to have backroom control. Deng was recognized officially as "the chief architect of China's economic reforms and China's socialist modernization". To the Communist Party, he was believed to have set a good example for communist cadres who refused to retire at old age. He broke earlier conventions of holding offices for life. He was often referred to as simply Comrade Xiaoping, with no title attached. Because of the Tiananmen Square protests of 1989, Deng's power had been significantly weakened and there was a growing formalist faction opposed to Deng's reforms within the Communist Party. To reassert his economic agenda, in the spring of 1992, Deng made his famous southern tour of China, visiting Guangzhou, Shenzhen, Zhuhai and spending the New Year in Shanghai, using his travels as a method of reasserting his economic policy after his retirement from office. On his tour, Deng made various speeches and generated large local support for his reformist platform. He stressed the importance of economic reform in China, and criticized those who were against further reform and opening up. Although there was a debate on whether or not Deng actually said it, his perceived catchphrase, "To get rich is glorious" (致富光荣), unleashed a wave of personal entrepreneurship that continues to drive China's economy today. He stated that the "leftist" elements of Chinese society were much more dangerous than "rightist" ones. Deng was instrumental in the development of Shanghai's Pudong New Area, revitalizing the city as China's economic hub. His southern tour was at first ignored by the Beijing and national media, which were then under the control of Deng's political rivals. Jiang Zemin, General Secretary of the Communist Party of China since 1989, showed little support. Challenging their media control, Shanghai's Liberation Daily newspaper published several articles supporting reforms authored by "Huangfu Ping", which quickly gained support amongst local officials and populace. Deng's new wave of policy rhetoric gave way to a new political storm between factions in the Politburo. Jiang eventually sided with Deng, and the national media finally reported Deng's southern tour several months after it occurred. Observers suggest that Jiang's submission to Deng's policies had solidified his position as Deng's heir apparent. Behind the scenes, Deng's southern tour aided his reformist allies' climb to the apex of national power, and permanently changed China's direction toward economic development. In addition, the eventual outcome of the southern tour proved that Deng was still the most powerful man in China. Deng's insistence on economic openness aided in the phenomenal growth levels of the coastal areas, especially the "Golden Triangle" region surrounding Shanghai. Deng reiterated that "some areas must get rich before others", and asserted that the wealth from coastal regions will eventually be transferred to aid economic construction inland. The theory, however, faced numerous challenges when put into practice, as provincial governments moved to protect their own interests. Deng died on 19 February 1997, aged 92 from a lung infection and Parkinson's disease. Even though his successor Jiang Zemin was in firm control, government policies maintained Deng's political and economic philosophies. Officially, Deng was eulogized as a "great Marxist, great Proletarian Revolutionary, statesman, military strategist, and diplomat; one of the main leaders of the Communist Party of China, the People's Liberation Army of China, and the People's Republic of China; The great architect of China's socialist opening-up and modernized construction; the founder of Deng Xiaoping Theory". The public was largely prepared for Deng's death, as rumors had been circulating for a long time that his health was deteriorating. At 10:00 on the morning of 24 February, people were asked by Premier Li Peng to pause in silence for three minutes. The nation's flags flew at half-mast for over a week. The nationally televised funeral, which was a simple and relatively private affair attended by the country's leaders and Deng's family, was broadcast on all cable channels. After the funeral, his organs were donated to medical research, the remains were cremated, and his ashes were subsequently scattered at sea, according to his wishes. For the next two weeks, Chinese state media ran news stories and documentaries related to Deng's life and death, with the regular 19:00 National News program in the evening lasting almost two hours over the regular broadcast time. Certain segments of the Chinese population, notably the modern Maoists and radical reformers (the far left and the far right), had negative views on Deng. In the year that followed, songs like "Story of Spring" by Dong Wenhua, which were created in Deng's honour shortly after Deng's southern tour in 1992, once again were widely played. There was a significant amount of international reaction to Deng's death: UN Secretary-General Kofi Annan said Deng was to be remembered "in the international community at large as a primary architect of China's modernization and dramatic economic development". French President Jacques Chirac said "In the course of this century, few men have, as much as Deng, led a vast human community through such profound and determining changes"; British Prime Minister John Major commented about Deng's key role in the return of Hong Kong to Chinese control; Canadian Prime Minister Jean Chrétien called Deng a "pivotal figure" in Chinese history. The Kuomintang chair in Taiwan also sent its condolences, saying it longed for peace, cooperation, and prosperity. The Dalai Lama voiced regret. When compared to the memorials of other CPC leaders, those dedicated to Deng have been low profile, in keeping with Deng's image of pragmatism. Moreover, he was cremated and his ashes were scattered at sea, as opposed to being embalmed like Mao. 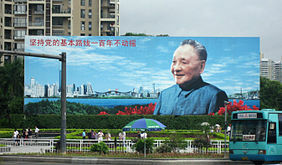 There are a few public displays of Deng in the country. A bronze statue of Deng was erected on 14 November 2000, at the grand plaza of Lianhua Mountain Park in Shenzhen. This statue is dedicated to Deng's role as a planner and contributor to the development of the Shenzhen Special Economic Zone, starting in 1979. The statue is 6 metres (20 ft) high, with an additional 3.68-meter base. The statue shows Deng striding forward confidently. Many CPC high level leaders visit the statue. In addition, in coastal areas and on the island province of Hainan, Deng is seen on roadside billboards with messages emphasizing economic reform or his policy of one country, two systems. Another bronze statue of Deng was dedicated 13 August 2004 in the city of Guang'an, Deng's hometown, in southwest China's Sichuan Province. The statue was erected to commemorate Deng's 100th birthday. The statue shows Deng, dressed casually, sitting on a chair and smiling. The Chinese characters for "Statue of Deng Xiaoping" are inscribed on the pedestal. The original calligraphy was written by Jiang, then Chairman of the Central Military Commission. Deng Xiaoping's Former Residence in his hometown of Paifang Village in Sichuan province has been preserved as a museum telling Deng's life story. In Bishkek, capital of Kyrgyzstan, there is a six-lane boulevard, 25 metres (82 ft) wide and 3.5 kilometres (2 mi) long, the Deng Xiaoping Prospekt, which was dedicated on 18 June 1997. A two-meter high red granite monument stands at the east end of this route. The epigraph in memory of Deng is written in Chinese, Russian and Kirghiz. A documentary on Deng entitled Deng Xiaoping was released by CCTV in January 1997 that chronicles his life from his days as a student in France to his "Southern Tour" of 1993. In 2014, a TV series commemorating Deng entitled Deng Xiaoping at History's Crossroads was released by CCTV in anticipation of the 110th anniversary of his birth. ^ "Deng Xiaoping". Collins English Dictionary. HarperCollins. Retrieved 8 March 2019. ^ "Deng Xiaoping" (US) and "Deng Xiaoping". Oxford Dictionaries. Oxford University Press. Retrieved 8 March 2019. ^ "Teng Hsiao-p'ing". Merriam-Webster Dictionary. Retrieved 8 March 2019. ^ Xia, Zhengnong (2003). 大辭海. 哲學卷. Shanghai: Shanghai Dictionary Publishing House. p. 38. ISBN 9787532612369. ^ Hsü, Immanuel C.Y. (2000). The Rise of Modern China (6th ed.). New York: Oxford University Press. p. 974. ISBN 9780195125047. ^ Cheng Li (2001). China's leaders. Rowman & Littlefield. ^ "Deng Xiaoping Is Dead at 92; Architect of Modern China". The New York Times. 20 February 1997. ^ a b c d e GREGOR BENTON. "Assessing Deng Xiaoping". jacobinmag.com. ^ Robert Dernberger (1993). China in the Era of Deng Xiaoping. Sharpe. Retrieved 13 March 2010. ^ "Luodai, a Hakkanese town in Sichuan Province". GOV.cn. 14 January 2008. Retrieved 16 November 2009. ^ a b "The arrival of the Hakkas in Sichuan Province". Asiawind.com. 29 December 1997. Retrieved 13 March 2010. ^ "Luodai, a Hakkanese town in Sichuan Province". GOV.cn. 14 January 2008. Retrieved 14 May 2010. ^ "Deng Xiaoping – Childhood". China.org.cn. Retrieved 14 May 2010. ^ Evans, Richard (1995). Deng Xiaoping and the Making of Modern China (2 ed.). Penguin. p. 5. ISBN 0-14-013945-1. ^ Vogel (2011), p. 18–20. ^ a b , Wang Song. "Chinese Revolutionaries in France". ^ "Exiled son who saved the state". Times Higher Education. 22 March 2002. Retrieved 2 December 2010. ^ Gao 2008. p. 46. ^ a b Minqi Li (December 2008). "Socialism, capitalism, and class struggle: The Political economy of Modern china". Economic & Political Weekly. ^ "Deng Xiaoping − The Years of Hardship and Danger". People.com.cn. 10 July 2007. ^ "Film makers flock to tractor factory to shoot Deng's stories". News Guandong. 26 July 2004. ^ "Deng Rong's Memoirs: Chpt 49". Archived from the original on 27 December 2008. ^ "Deng Rong's Memoirs: Chapter 53". Archived from the original on 27 December 2008. ^ "1977: Deng Xiaoping back in power". BBC News. 22 July 1977. Retrieved 21 July 2011. ^ "MFA, Singapore Press Release". App.mfa.gov.sg. 29 December 2005. Archived from the original on 2 March 2012. Retrieved 27 November 2011. ^ Yu, Guangyuan (2004). Deng Xiaoping Shakes the World: An Eyewitness Account of China's Party Work Conference and the Third Plenum (November-December 1978). EastBridge. ISBN 978-1891936531. ^ "In quotes : Deng Xiaoping". Peoples Daily, China. 20 August 2014. Retrieved 24 October 2017. ^ "In quotes - Deng Xiaoping". China Daily. 20 August 2014. Retrieved 26 June 2017. ^ "Reformer with an iron fist". CNN. Retrieved 26 June 2017. ^ "Strike less hard". The Economist. 3 August 2013. ^ "The Three-Step Development Strategy". china.org.cn. Retrieved 28 November 2010. ^ a b Nathan, Andrew J. (January – February 2001). "The Tiananmen Papers". Foreign Affairs. Archived from the original on 19 December 2008. ^ "Voices for Tiananmen Square: Beijing Spring and the Democracy Movement". Socialanarchism.org. 8 February 2006. Retrieved 13 March 2010. ^ Palmer, Bob (8 February 2006). Voices for Tiananmen Square: Beijing Spring and the Democracy Movement. Social Anarchism. 20. ^ Deng Xiaoping's daughter defends his Tiananmen Square massacre decision. Taipei Times. 25 June 2007. ^ Miles, James (1997). The Legacy of Tiananmen: China in Disarray. University of Michigan Press. ISBN 978-0-472-08451-7. ^ Iritani, Evelyn (9 September 2004). "Great Idea but Don't Quote Him; Deng Xiaoping's famous one-liner started China on the way to capitalism. The only problem is there's no proof he actually said it". Los Angeles Times. p. A1. Retrieved 13 March 2010 – via Pqasb.pqarchiver.com. ^ "China Daily article "Deng Xiaoping statue unveiled"". China Daily. Retrieved 13 March 2010. ^ "Turkistan-Newsletter Volume: 97-1:13, 20 June 1997". Google. Archived from the original on 4 October 2007. Retrieved 2 December 2010. ^ 文献纪录片《邓小平》 (in Chinese). CCTV. Clark, Paul (2008). The Chinese Cultural Revolution: A History. Cambridge and New York: Cambridge University Press. ISBN 978-0-521-87515-8. Evans, Sir Richard (1995). Deng Xiaoping and the Making of Modern China (Second ed.). Penguin Books. ISBN 0-14-013945-1. Vogel, Ezra F. (2011). Deng Xiaoping and the Transformation of China. Cambridge, Mass. : Belknap Press of Harvard University Press. ISBN 978-0-674-05544-5. Baum, Richard (1996). Burying Mao: Chinese Politics in the Age of Deng Xiaoping (updated ed.). Princeton, N.J.: Princeton University Press. ISBN 978-0-691-03637-3. Maomao (1995). Deng Xiaoping: My Father. New York: BasicBooks. ISBN 0-465-01625-1. Meisner, Maurice J. (1996). The Deng Xiaoping Era: An Inquiry into the Fate of Chinese Socialism, 1978–1994. New York: Hill and Wang. ISBN 0-8090-7815-5.